Right around two months ago, my artistic friend Dax invited me to come to his house, nicknamed Cakebread Castle, for a small concert that would feature musicians (both local and from afar) as well as puppets and, if you showed up early enough, homemade vegan blueberry pancakes. I was already somewhat infatuated with Dax's creations, so it was a foregone conclusion that I would attend. Even so, the concert still exceeded my wildest expectations. You can find the full set of photos by clicking here, or read on to learn a bit about the players. This is Dax Tran-Caffee, a puppet-maker, puppeteer, painter, musician, engineer, and craftsman all rolled up into one person. He has a tact for coming up with somewhat eccentric ideas and then making them work brilliantly. The suitcase above tells a story. 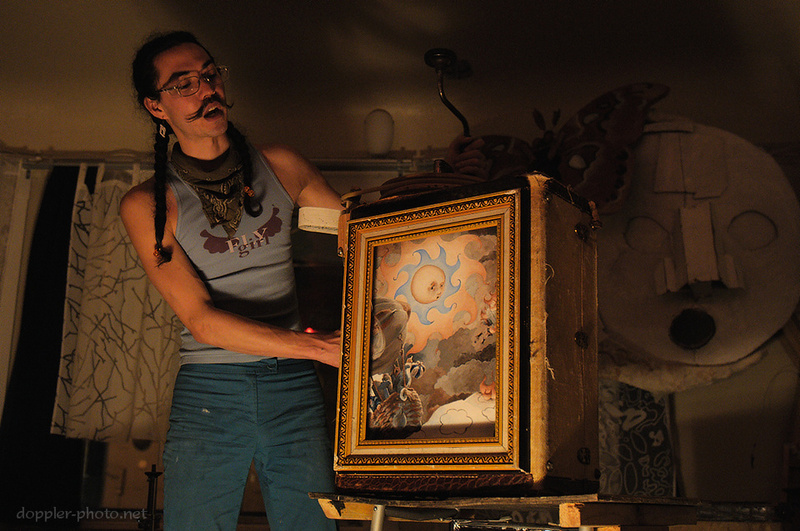 More precisely, as Dax turns the handle with his hand, a long piece of hand-painted canvas winds through the picture frame viewport, as a small music box (top-left of the suitcase) plays an accompanying ditty, while Dax himself narrates. The simple beauty of it is that the canvas is simply one giant loop, and the end of the story takes you back to the beginning as well. The cozy and casual nature of the performance area matched the style of the audience pretty well. 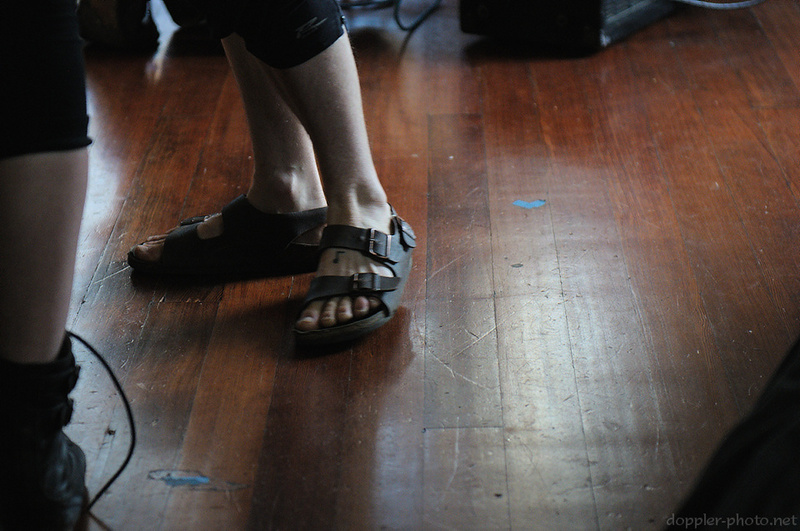 I really liked the music-note tattoo on this woman's foot. 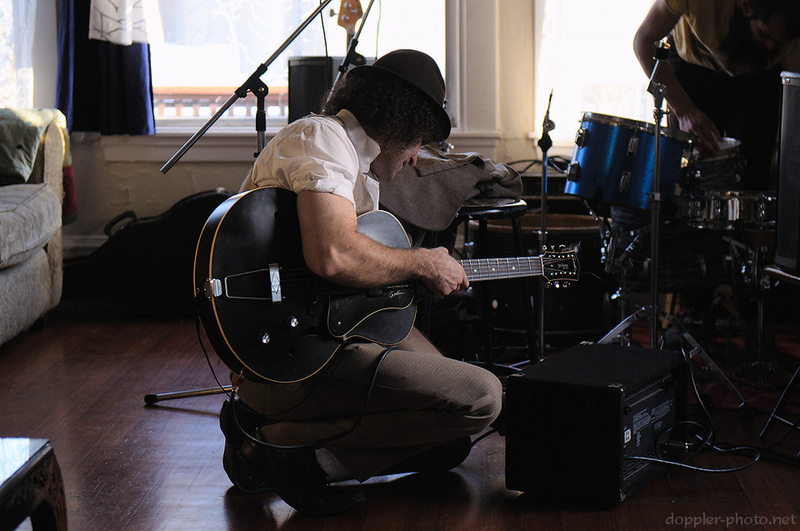 This is Avery Burke, the lead singer and guitarist for a band called Corpus Callosum, of which Dax and other Cakebreak Castle occupants are also members. Avery played a few pieces with his characteristic half-singing, half-shouting style, and invited us to shout along for some of the songs. 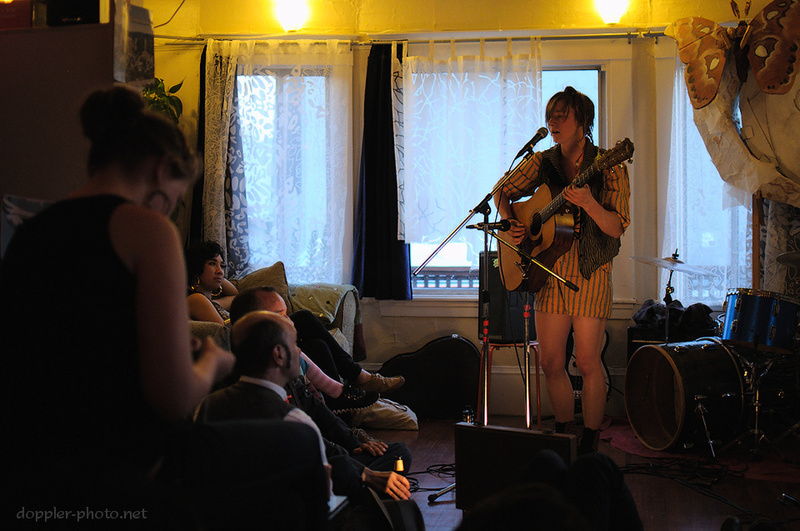 The concert also featured three touring musicians based out of Olympia, Washington, including Abigail Peachtree (pictured above), and Eleanor Murray & co (which included Peachtree, lead singer Eleanor Murray, and bassist Joshua James). Finally, the concert included Oakland-based artist Ruby Mountain (left, facing toward right). I chatted with her after the show and she mentioned that it was her first time performing for an audience, given which she did admirably.